Our 68th DVD is now ready for immediate shipment. 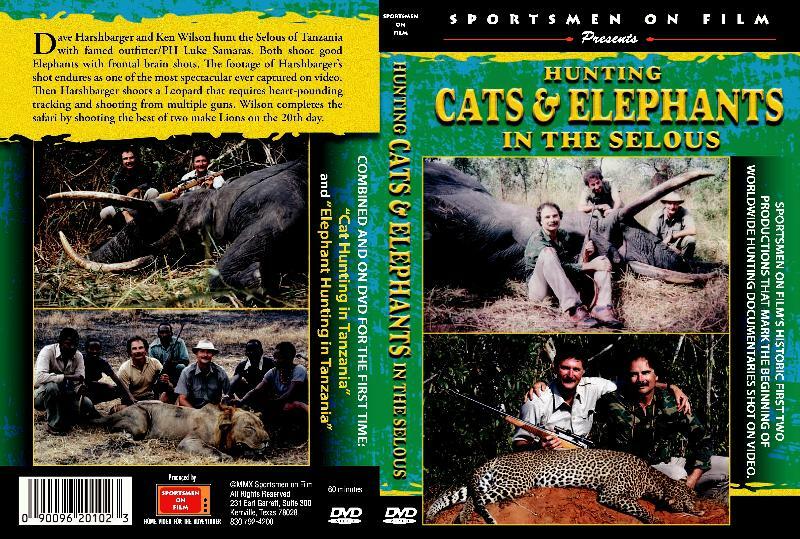 It is titled "HUNTING CATS & ELEPHANTS IN THE SELOUS" and consists of two titles combined and available on DVD for the first time: "Cat Hunting in Tanzania" and "Elephant Hunting in Tanzania." You will see an excellent discussion, with video support, on where to place the heart-lung shot, the side-brain shot, and the frontal-brain shot. Then, hunting with famed PH Luke Samaras in the Selous, both Dave Harshbarger and Ken Wilson shoot excellent Elephants with frontal-brain shots. As the cover says: "The footage of Harshbarger's shot endures as one of the most spectacular ever captured on video." For the Cat portion, Harshbarger shoots a Leopard and Wilson shoots a Lion. You will also see the on-camera hunting of a few bait animals: Nyasaland Wildebeest, Lichtenstein Hartebeest and Southern Impala (that's right, the Selous has the Southern and not the East African). Despite some reports to the contrary, Chris Weth of Uganda Wildlife Safaris reports that his 2011 season will be conducted in all of his concessions January - November 2011. On August 27, Chris emailed me that renowned PHs "Dougie Stephenson and Tony Moore are going to start with field work in about 3 weeks from now. I will as well have some more areas for next season." NOTE: The 2011 season and quotas are booking up so don't wait too long to get your dates. For anyone that can drop everything and fly to California, there is a terrific deal available on a Tule Elk hunt ... only $8,500.00 for a trophy bull. Ken Wilson is dropping everything to make this hunt mid-September. You can join him or go later in September. The ranch is 2-1/2 hours from the Santa Barbara Airport. For Barren Ground Caribou in Alaska, the 500,000 strong Western Arctic Herd is currently the largest in Alaska. You will need to drop everything and fly to Kotzebue for a 5-day FULLY GUIDED HUNT FOR TWO CARIBOU the latter part of September but instead of the regular price of $6,000 you will pay only $3,950. Two openings only. To order the DVD, go to www.sportsmenonfilm.com, or email kwilson@sportsmenonfilm.com or call 800-910-HUNT (4868). For information on hunting Uganda, Europe, or Namibia, go to the website or call. For the Tule Elk or Caribou hunts, you better call ASAP.